These days we have many ways to connect to the Internet, through a standard telephone line, a high-speed service at home or office (such as cable, DSL, ADSL, or satellite), the “hotspot” (wireless) connection points widely available in big cities (Starbucks, libraries, airports, shopping malls), or through the use of your mobile/cell phone. Therefore you need to have all of these at your disposal because you never know when you’ll be Internet stranded. The most popular way for travelers to check emails and to access the Internet has been at the, so-called, Internet-email cafés. (Let’s call them IECs.) Business such as these are quit common in the high tourist areas throughout the world. In developing countries, IECs are even more prevalent since many local people who cannot afford a computer of their own have to go to the shop down the street. Although some of IECs prefer that you do not transfer their LAN cable (which looks like a standard telephone line, only fatter) connection over to your laptop, the majority of IECs are quit helpful in getting your Internet Protocol (TCP/IP) configured. In fact, many of the IECs have made special, very comfortable seating areas especially for the Laptop Hobo. 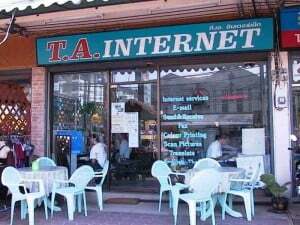 (Even more amazing is that some of these Internet cafés actually have food and drink for sale!) In addition to the commercial IECs, you can often check emails and connect your laptop to the Internet at community libraries. Connecting: Disconnect the LAN cable from the terminal you are using and connect it into your LAN (RJ-45) port. If your LAN connection does not configure automatically (most will), then you may may have to input the settings manually. Here’s how (that is, if there is no one there to help you): In Network Connections, right-click Local Area Connection; choose Properties; choose Internet Protocol (TCP/IP). Then match the IP and DNS addresses to that of the terminal you are using. When land-line connections are unavailable and no wireless hotspot points are around , what do you do? Use your mobile/cell phone! Just like your standard (land-line) telephone, your mobile phone (with Bluetooth capability) will connect your laptop to the Internet. The speed may be as slow as George W. Bush admitting to a Global-warming problem, but you can get on to the Net in some of the most remote and mobile areas (eg: islands, small villages, trains). As just stated, there is very little difference (other than speed) between your land-line connection at home and the one through your mobile phone. If you your mobile/cell phone has Bluetooth capability (which is a radio frequency that enables devices to connect to one another without wires), as well as your laptop (or have the external attachment), then all you need is ISP dial-up account (such as a pre-paid “scratcher” card). Please note that Bluetooth does not configure to mobile/cell phones in many countries. Additionally, not all mobile/cell phones work in all countries (therefore, be sure that you select either a GSM or a tri-band mobile phone for when you travel). Connecting: similar to that of standard dial-up (land-line) service above. In Network Connections, choose the Create A New Connection wizard; choose Connect to the Internet; choose Set Up My Connection Manually; choose Connect Using a Dial-up Modem; [here, however, a screen will appear with the option of using your standard modem, or the Bluetooth link. Choose the Bluetooth link]; give this ISP connection a name, eg: London dial-up; enter the ISP’s telephone number (a list will be provided to you from your service provider); enter the User Name and Password (which is case sensitive); select Finish. As for your mobile phone, you will need to follow the instructions provided with the unit. 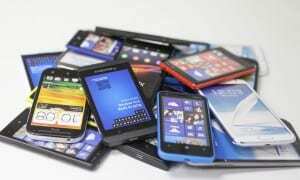 Do note that your mobile phone set-up procedures will probably offer you password protection. This is a good option. Just remember not to forget what your 4-digit number is! If you are going to be in place for several months and the local high-speed Internet Service Provider does not require a lengthy contract, you may be able to take advantage of this preferred Web access option. This is especially useful for those whose work involves very large file sizes. You’ll need to check to see what the minimum length of contract is and whether the property you’re renting has the right connections (cable or DSL). There’s an increasing number of 3G and 4G mobile broadband services these days so if you can’t get a wired service take a look at some comparable mobile services. These usually cost more so beware. It also varies wildly from country to country. Australia for instance has a very expensive mobile broadband service while Malaysia has a relatively cheap 4G mobile service. Before you depart for your country/location of choice, find out what your connectivity options are—and more importantly, how easy/difficult it is to access them. Just because a country is well-known for its prevalence in Internet use does not necessarily mean that it is easy for the passing visitor to access. The United States, for example, has Internet access in about 75% of all homes. Therefore, local Internet-email cafés/public access points are often difficult to find (save for the extreme tourist areas). Furthermore, the availability of web “scratcher cards” are almost nonexistent. However, developing countries often have Internet cafés/public access points (as well as pre-paid “scratcher” dial-up cards) in abundance for the masses who cannot afford a computer of their own, or the long-term service agreement. Check the Web (Lonely Planet’s Thorn Tree forum and the expat blogs are often helpful) and your guide book for information on Internet availability and options before you leave.